We make steel tanks and pressure vessels used in a variety of applications. Often the process starts with a mechanical engineer’s design that follows the standards set out by the ASME BPVC code. In this example below, we are working with the engineers for an industrial chiller manufacturer in Pennsylvania. They provide refrigeration solutions to dairy farms, food processing companies and re-circulation tanks that cool industrial equipment. For this client we make 4 common sizes using 304 grade stainless steel. This grade resists oxidation, corrosion and is very durable. It holds up beautifully to stress and performance tests we conduct on each tank we make. We buy sheets of 11 gauge (0.120”) stainless and cut some of those to circular blanks in preparation for the spinning process. The body of the tanks are fitted for our cold rolling process. The tooling for the metal spinning is done on our CNC Lathe. We start with a compressed block of maple. So that means we have 4 different mandrels to maintain based upon the different tank sizes we make. The smallest steel tank we make for this client is a 30 gallon. We also make a 60-gallon tank, a 90-gallon tank and a 120 gallon tank. The run sizes range between 5-15 tanks every 2 months. On occasion, we are asked to do some specialty sizes and since 1998, we have made about 20 – 600 gallon steel water cooling tanks used in some very large industrial process chillers. Each end cap is manufactured on our metal spinning machines and formed over the tooling for this specific job. They are perfectly symmetrical and have the proper flange to be welded to the tank body. Each cap end has 3-4 metal fittings cut and welded into it to manage the flow of liquid and are sized to fit securely to the rest of the chiller components. 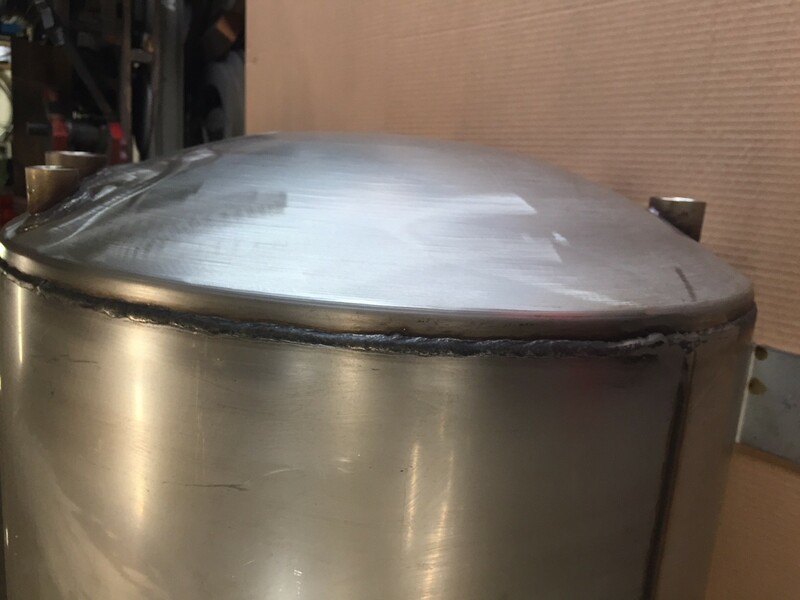 The welding work on each seam must be top notch and able to withstand performance testing and leak testing done by the client. We use a resistance seam welder for the vessel body and a TIG welder to connect the caps and fittings. Our guys all have years of welding experience and we have this process down to a science. The liquid reservoir tanks we make have never had an issue and we have been making them for over 20 years now. That is a pretty good track record. We can also make food and beverage grade stainless steel tanks in a similar fashion. This may require 316 grade stainless steel depending upon the application. 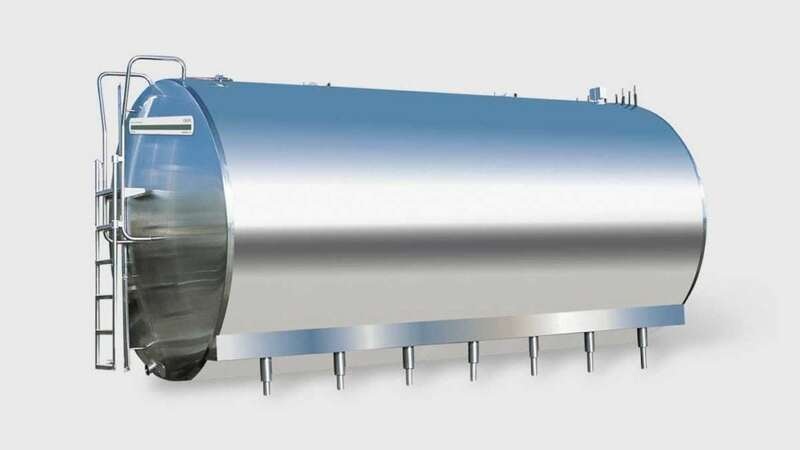 Milk cooling tanks and other tanks that come in direct contact with the product may require a specialty coating, higher polishing or different grade of stainless steel. 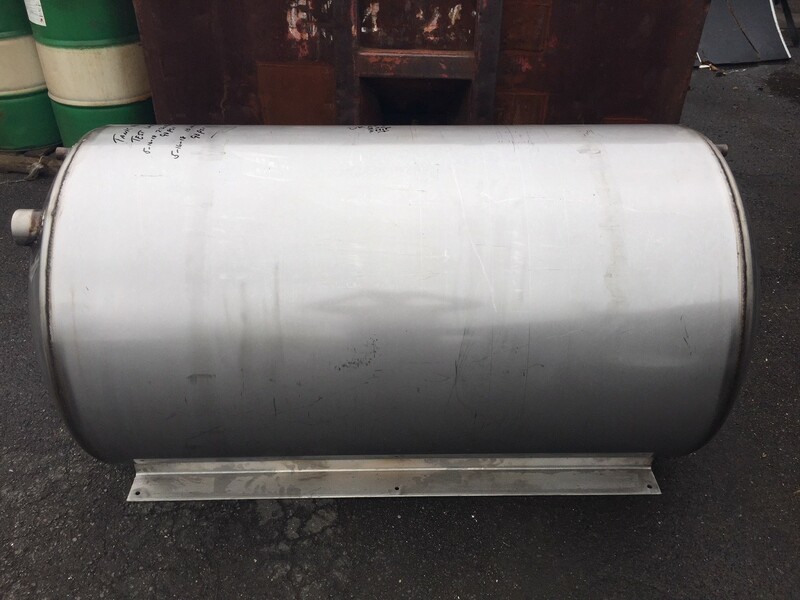 It is important to know the differences between 304 and 316 grade stainless steel when selecting the right material for your food processing tanks. Corrosion resistance is the big difference in the two different grades of stainless steel. The 304 grade has 18% chromium and 8% nickel while 316 has 16% chromium, 10% nickel and 2% molybdenum. Both of these 300 grade steels are known best for their excellent welding and forming properties. This makes them applicable across many industries. The 316 grade resists corrosion from high saline and acidic fluids so if you are processing liquids high in salt content or high in acid content, then this may be the better choice. What is important to know is that your team at Charles Schillinger is an excellent partner for manufacturing pressure vessels, steel tanks and liquid reservoirs. We look forward to earning your trust as a valued supplier of commercial metal forming, metal spinning stainless steel and deep drawing stainless steel tanks.